How to link PAN card with Aadhar Card online? As per the judgement passed by the Honourable Supreme Court of India on 26th September 2018, it has now become mandatory for all individuals, companies, firms and HUFs to link their PAN CARD with AADHAR CARD details. Earlier the last date for linking was on or before December 31st 2017 which was later extended to 31st March 2018 and then to 31st June 2018. However, to facilitate linking by each and every citizen of India, the date was further extended till 31st March 2019. Multiple Pan card users will be restricted. Tax evasion will be prevented. The e-filing process of income tax return will be simplified. 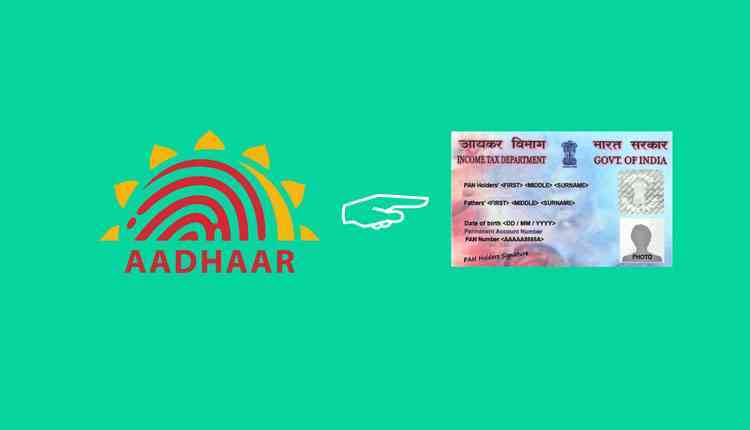 The government has also affirmed that if a person doesn’t link his/ her Pan card details with Aadhar card within the said time period then the person’s Pan card will be deemed invalid. Moreover, even if a person succeeds in filing income tax return without linking Pan details with Aadhar card the income tax department will make sure not to process the ITR without the completion of linking process. If an NRI/ foreign citizen living in India possess an aadhar card then he/she also needs to do the linking process. Even if a person’s yearly income falls below 2,50,000/- then also he/she is required to complete the said process irrespective of whether the person will opt for filing income tax return (ITR) or not. In case of HUFs, aadhar card of Karta while in case of none corporate organisations, aadhar card of principal contact of the organisation is linked with the pan card of HUF/ Firms/ corporates. In this article we will show you how to link up your PAN CARD with AADHAR CARD through online mode in an easy to remember way. The income tax department has it’s own website for e-filing of income tax returns. A person has to visit the website and there he/ she can easily complete the process of linking. The income tax department has made the process very easy as the person now doesn’t require to register and log-in with the website for linking Pan card with aadhar card. In fact, the tax payer can do so by an easy 3-step procedure without log-in. Step 1 — Visit the website : www.incometaxindiaefiling.gov.in. In the homepage you will find the link on the left pane as link aadhar. Click on the link. Step 2: Enter the following details : PAN, Aadhar number, Name as specified on the aadhar card. If you have only the year of birth mentioned in your aadhar card please tick on that option. Then tick right on “ I agree to validate my aadhar details with UIDAI.” Enter the CAPTCHA Code and submit. For visually impaired person, an OTP will be sent to the registered mobile number instead of filling up the CAPTCHA. Step 3: UIDAI will verify all the credentials and after that the process of linking will get confirmed. Make sure that the Name, Date of Birth (DOB) and/or Gender in your Pan card and aadhar card matches otherwise the linking process will fail. In case of minor mismatch with the name provided in the aadhar card, an OTP will be sent to the email id and mobile number registered on UIDAI. You need to fill that OTP and verify the details and continue with the linking process. For major mismatch you need to either update on the UIDAI site for correcting aadhar details or NSDL website for PAN details. This update takes time of about 20-25 days as it has to undergo another kind of screening and verification of your documents. Only after this update you can link your PAN details to AADHAR details. It is a 5 step procedure to link your PAN CARD with AADHAR CARD. Step 1: If you are already registered in the e-filing portal of income tax department, log-in to the website by entering all the user id, password and date of birth. If you are not a registered user then you need to register yourself first. Step 2: After logging in, a pop up will appear that will prompt you to link your Pan card with Aadhar card. You can also visit profile settings present on the blue bar at the top of the portal after login. There you will see the option of link aadhar. Click it and continue with the linking process. Step 3: Your details, already filled, like name, date of birth and gender will appear on the screen as per the details that you had mentioned at the time of registration. Verify those details and if found correct enter your aadhar number. Step 4: Now enter the CAPTCHA code and click on the link aadhar option. Step 5: A pop up message will appear providing information about the linking of pan card with aadhar card. How to link PAN with Aadhaar Card through SMS? Example: UIDPAN 123456789043 DKPLO2124M and send it to 567678 or 56161. So, this is how you can easily link up your Pan card details with Aadhar card sitting at home.